It is my last morning in Zacatecas. I am waiting for the Huichol women to set up their tables and lay out their wares near Jardín Juárez. I am on a mission: to buy a necklace or some earrings. I know what magic these women’s fingers can weave with brightly colored beads. I should have bought the necklace yesterday, but I am the world’s worst procrastinator, and now I have only until noon to accomplish my task. Then I leave for the airport. Because I am an early riser, I have several hours to wander the empty streets. The women will not arrive until at least 10 a.m.
My wanderings take me to the Alameda García de la Cadena, one of the city’s most alluring parks, long, languid, and lush with fountains, flowers, and fences. Posted on February 17, 2012, in Alameda García de la Cadena, Friday's Fences, haibun, Haiku My Heart, Himmelsk, Mexico, Poetic Bloomings, Shadow Shot Sunday 2, Sky Watch Friday, The Haiku Challenge 2012, Zacatecas. Bookmark the permalink. 46 Comments. Great photo! I love the riddle haiku-it sounds like one of those zen koans! Oh wow, what a beautiful ‘riddle haiku’…. did you find a necklace/earrings? I did, and plan to post a story/haiku about that discovery this evening. Love the angle of this shot….love the blue sky too! Great words for the pic. I can see them pinned there. They are both beautiful – the photo and the haiku. Thank you for sharing! Am so curious to see what you bought! Love this! I hope you share pictures of your baubles! love this haiku and photo too! This is one of may all time favorites posts and Haiku’s yet! And you know I love them all. So–where’s a pic of the necklace?? Have a super weekend–see ya on SSS!!! I don’t know. But i like the picture. This piece takes me back to back to the times I too have searched… for clouds and necklaces… your riddle will be rolling around in me all day, waiting for me to wake up… just wonderful, thank you! I’m excited to see the results of the necklace search. And, my answer to the riddle would be “As many as the sky will allow”. A dramatic shot. Hope you found what you were looking for. I love the way you composed that shot! i love your reminiscing…and your haiku. you have also inspired me to look for a certain Huichol woven bag that i cannot wait to give you! i stumbled on some sets of beaded earrings that i purchased from Huichol women in the late 70’s. you are stirring many mystical memories, thank you for the joy of it all. Now all of this sounds like a magical mystery to me! Love your photo and the words. I felt like I was there, too. Did you find a necklace? This is mystical and beautiful, I see the women in a train walking resolutely forward one behind the other in strength. This reminds me of my art photography specialist piece at college called ‘armed forces’, I will haiku it one of these days, keep a look out! Simply beautiful! You are an awesome photographer! Every click of yours is absolutely amazing! I’m so enjoying your commentary with your posts this week – it puts me there with you! Wonderful Haiku with this one. Such a beautiful blue sky MMT. Lovely photo of a shadowy morning! Quite exhilerating! Often I take photos to while away time while waiting! It gives purpose and interest to the wait! What a lovely capture of tones and light, nature and contrasts. I, too, put things of to the last minute…mistake, usually. Mornings are wonderful, seeing the day come to life as the sun rises and people begin to move about. 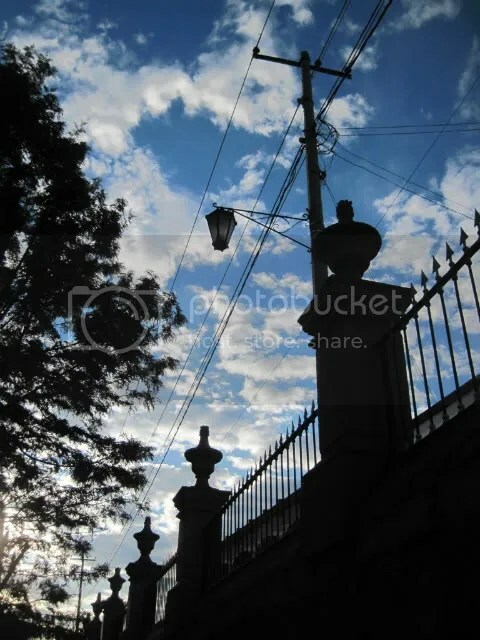 Your photo is amazing with the darkened fence against a beautiful sky. Amazing!! Trust you found the jewelery you wanted. You certainly found a truly awesome sky sight. Gorgeous fence under an amazing sky! How many of us forget to look up and see the wonder of cloud formations? Not us, poets and photographers! Thanks for making me look up at your skies. Thank you…for the beautiful photo and for stopping by my blog! Lovely shot…too bad the wires are everywhere we want a shot!